COATS Phase 4 has five main projects within its scope. Technology transfer is a key component and Phase 4 continues to support the Western States Forum. This phase is also looking at how to best deploy technologies developed under COATS and spinoff projects, as well as evaluating and examining new issues and deployments. Finally, expansion of the COATS region to include areas of other states, under the umbrella of the Western States Rural Transportation Consortium, is also being investigated. An engineering practitioner's conference with the goal of providing a forum for high-quality exchange of technical information that can help to support better ITS deployment in rural areas. It is a forum for dynamic discussion of practical and technical issues associated with rural ITS, to promote transferability of solutions and knowledge across the ITS community. Four to five highly interactive technical presentations, ranging in length from 1 to 2 hours each, in-depth equipment and software demonstrations, and numerous opportunities for networking with peers, are all part of the agenda. The 2011 Forum was held in Yreka, California June 14th - 16th. Go to the Forum website at www.westernstatesforum.org for more information. Through California Oregon Advanced Transportation Systems (COATS) area research efforts, several web-based research products have been developed, including the WeatherShare system, the Integrated Corridor Management Clearinghouse (ICM) system, the One Stop Shop for Traveler Information system (OSS) and the Integration of Aviation Automated Weather Observation Systems (AWOS) with Roadside Weather Information System (AWOS/RWIS). These systems have been recognized as valued products in improving transportation services. Currently these products are being used while running in a laboratory environment and many of the factors related to transitioning them to a production/deployment environment have not previously been fully addressed. For more specific details about this project and recommendations, you can review the report here. You can also access the report from the COATS Documents page and the COATS Phase 4 Documents page. Applications of radar speed signs are typically made in an unscientific manner and are the result of either subjective judgment or, more rarely, engineering studies. The devices are placed wherever there is a perceived problem with little quantification of the problem itself. As part of the COATS project, the project team has developed warrants for the use of radar speed signs in California, specifically in the COATS region. Radar Speed Sign devices are known by several different names, including mobile roadside speedometers, speed trailers, dynamic speed displays, speed displays, speed feedback signs, driver feedback signs, and speed monitoring displays. Regardless of the naming convention, each describes the same general device. Summary tables of past research results of radar speed sign deployments are available here. Over the course of the project, two levels of guidance were developed: general guidance and location-specific guidance. This guidance was based on a review of maintenance practices and the evaluation of the effectiveness of such signage in applications similar to those intended for use in California. In addition to developing guidance for the use of radar speed trailers, specifications were developed for such equipment to guide practitioners	in future purchases and deployments. The specifications developed related to the physical and functional specifications for both permanent post-mounted radar speed signs (and portable post-mounted signs) as well as trailer-based radar speed signs. To review the final project report click here or go to the COATS Phase 4 project Documents page. Recently, a paper and a poster entitled Guidance for Radar Speed Sign Deployments were presented at the 91st Annual Meeting of the Transportation Research Board in Washington, D.C. You can review the paper here as well as view the poster. These documents are also on the COATS Phase 4 Documents page. This project evaluated the Icy Curve Warning System (ICWS) deployed on Fredonyer Summit and the system’s impact on vehicle speeds and crash occurrence. 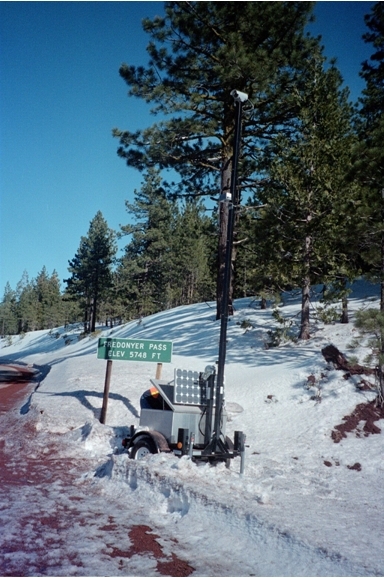 The Fredonyer Pass ICWS was deployed by Caltrans to increase motorist vigilance and reduce the number of crashes occurring during icy pavement conditions in real-time. The ICWS consists of pavement sensors to detect icy conditions, in combination with dynamically activated signage to provide motorists with real-time warning when icy conditions are either imminent or present. The system is intended to alert motorists of icy conditions, eliciting a decrease in vehicle speeds during such conditions. Consequently, lower vehicle speeds are expected to translate to reduced crashes along the length of the curves which have presented safety challenges in the past. Based on the results of this work, a number of conclusions have been drawn. First, the statistical analysis of speed data suggested that the system is working as intended and that vehicle speeds are significantly lower. This was particularly true of speed during clear, cold and dry weather conditions, when a driver would not necessarily expect to encounter ice. Additionally, a crash rate method was used to investigate the effect of the ICWS on crash severities, with a focus on ice-related accidents. Investigation of crash rates indicated that the ICWS provided safety benefits of $1.7 million dollars per winter season during the “after” deployment study period. Finally, feedback from Caltrans maintenance and ITS forces indicated that the system is an improvement over traditional metal signage and is generally functioning as expected. Such a system does require careful planning prior to deployment and on-going maintenance in order to operate as expected. For more information about the Fredonyer Summit Icy Curve Warning System and the evaluation, review the final report here. The final report can also be found on the COATS Phase 4 Documents page. Two papers, a presentation, and a poster were presented at the 91st Annual Meeting of the Transportation Research Board (TRB) in Washington, D.C. A presentation entitled Speed Impacts of an Icy Curve Warning System was given in the Weather Impacts on Surface Transportation session. The presentation can be reviewed here. A paper with the same title was also submitted for inclusion in the Meeting Compendium and you can review the paper here. A poster and a paper about Safety Effects of Icy Curve Warning Systems were also part of the 91st Annual TRB meeting. You can review the paper here as well as view the poster. All of these documents are also on the COATS Phase 4 Documents page. Establish a consortium comprised of California, Oregon, Washington and Nevada to facilitate and enhance safe, seamless travel throughout the western United States. The Consortium seeks to promote innovative partnerships, technologies and educational opportunities to meet these objectives. More information regarding the consortium can be found here.